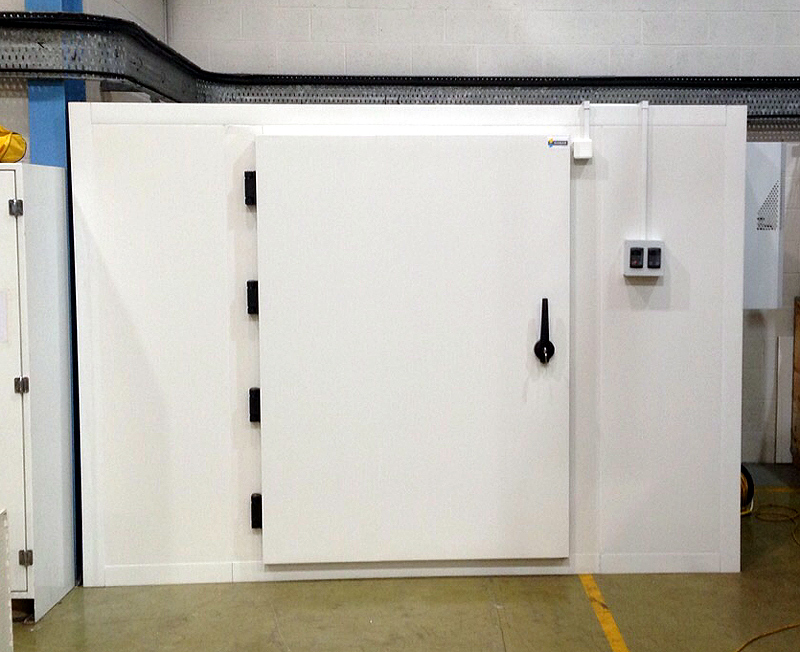 As leading suppliers of cold room panels, we have been asked to fulfil many cold storage installation projects over the years. The scale of the cold room builds has varied enormously from large commercial cold storage (chillers and freezers) to small, modular cold room facilities such as for bakeries, labs and pharmacies. The real need for cold room installation expertise has always tended to fall more into the large, industrial cold storage market. For example, when we assisted the principal installer of a new-build, automated freezer warehouse in the UK for ice cream and frozen dessert storage. We supplied the cold room panels for what proved to be one of the largest panel structures ever built on a UK industrial site. That kind of installation, however, does not happen every day! The advent of modular assembly panels now means the smaller cold rooms which we were often asked to install can now actually be assembled by our customers themselves. Our current Walk In Cold Room Package Deal offers just such an opportunity. With full instructions supplied and a compliment of cold room shelving and monoblock refrigeration, you can now buy and install your own small chiller or freezer (internal size from 3.64m3 to 11.64m3). With just 2 people required for the installation (provided good health and safety practices are followed), we find many customers keen to consider this ‘cold room kit’ option. This is great news for many businesses who need a new chiller or freezer – from fast food chains to florists, labs and lots more. Having said that, if a customer prefers, we can quote for an installation package and this is what happened recently. 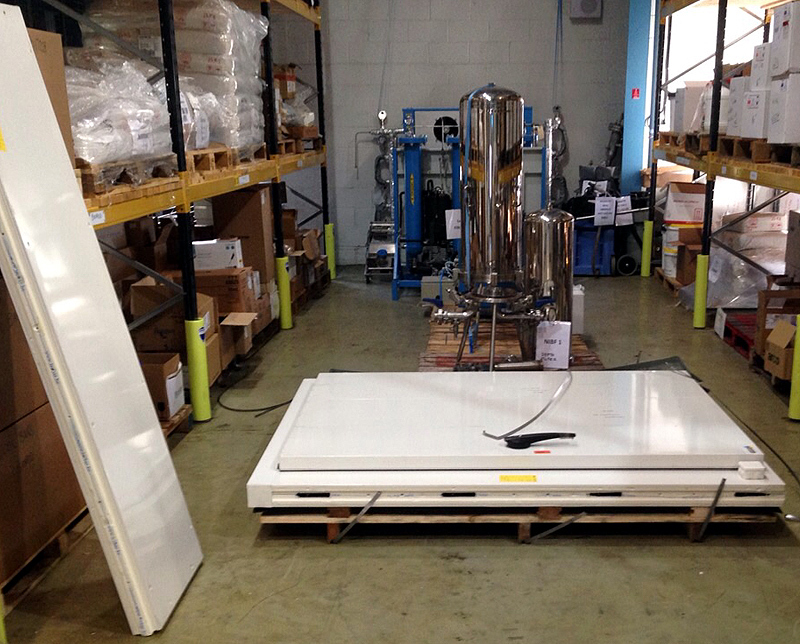 A customer involved in the UK chemical sector needed a walk in cold room but it had to offer very specific criteria. They wanted to be sure that all their strict requirements were met so we put together a special order for them including the attendance of two of our personnel on site to carry out the installation. The cold room needed to operate within a temperature range of -22 C to +12 C.
The purpose was for the storage of intermediate bulk containers (IBC) carrying chemical solution, some of which had to be stored at different temperatures. The cold room access door had to be a specific size in order to accommodate a regular IBC liquid container (average weight 2 tonnes). To provide the facility of operating at different temperatures, we installed 2 quality refrigeration units, connected to one control panel with one unit operating at positive temperatures and the second operating at negative temperatures. To provide the right quality and size of cold room panel we selected, supplied and installed ISOBAR polyurethane injected panels with Cam Lock System. 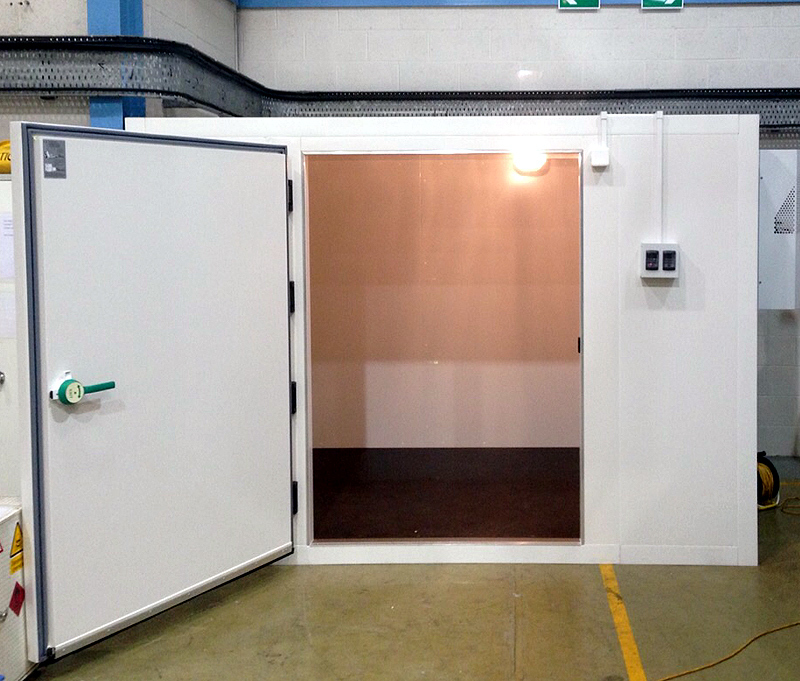 The final cold room size came out at 3 x 3 x 2.1m and was assembled by 2 of our personnel and deemed ready to operate within less than 6 hours.